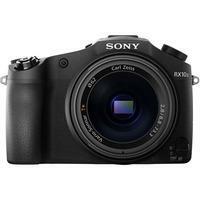 The Sony Cyber-Shot RX10 II brings the world's first stacked Exmor RS 1.0 type CMOS sensor with a DRAM memory chip, 40x super slow motion capture, 4K high-resolution video, high-speed anti-distortion shutter (with max. shutter speed of 1/32000secs) and more. The camera brings a new high-contrast XGA OLED Tru-Finder for true-to-life image preview and playback, in addition to an upgraded AF system that enables up to 14fps continuous shooting. The RX10 II adds dust and moisture resistance but maintains the same body design as its predecessor, incorporating a Zeiss Vario-Sonnar T* 24-200mm (35mm equivalent) f/2.8 lens in a lightweight and portable magnesium-alloy body.